We now begin our reflections on the second half of the Hail Mary, the Church’s response to the Biblical words in the first half. The first thing we say, to sum up our understanding of Mary, is that she is holy, a saint: “Holy Mary.” But this needs some untangling. People often say it is hard to relate to Mary because she is holy and we are not. A standard joke imagines the Holy Family doing an evening examination of conscience. “What sins did you commit today?” Jesus: “I can’t think of any.” Mary: “yeah, I think I’m good.” And then poor St. Joseph is the only one who did anything wrong – though he too is this dazzlingly innocent guy, pretty much completely unlike us. It seems like “saint” means “someone I can’t relate to.” And if Mary is Queen of the Saints, holiest of the holy, then she is the ultimate in unrelatable. The first problem with this view is that it misunderstands how one gets to be a saint. Sometimes people think the Immaculate Conception – the doctrine that Mary was conceived without any stain of original sin – means that she had it easy, and never struggled. We, on the other hand, have to work really hard to be good. To the contrary, the Immaculate Conception means – as we saw in the first half of the Hail Mary – that she is full of grace. The same grace God offers us. Mary is holy because she always clings to the divine assistance. The doctrine of the Immaculate Conception just doubles down on this by pointing out that the first move was God’s: always it is God who makes us holy, and holiness is nothing but holding onto that help. Pelagianism is the heresy that thinks that, on some level, it all depends on us. It doesn’t. Jesus saves. Jesus saved Mary. (Even before he was born! Just as Jesus saved Abraham centuries before he was born.) Grace saves. It is the Holy Spirit who makes us holy. The reason we point to Mary as the highest of the saints is precisely to make clear that this is always the work of God: always a matter of staying close to Jesus, and always God acting before we do. How do we relate to Mary? First, by relying on the grace of Jesus Christ. A second wonderful, relatable thing about Mary’s sanctity: Where does she live it? Mary didn’t do anything even slightly interesting in her life. Well, okay, she was the Mother of Jesus. But her role there is as humdrum as humanly possible: she lived closeness to Jesus by being a wife and mother of an ordinary, working-class family in an extraordinarily uninteresting corner of the Roman Empire. The Joyful Mysteries of the Rosary remind us of this ordinary life. The Luminous Mysteries remind us that Mary listened to Jesus just like we do. 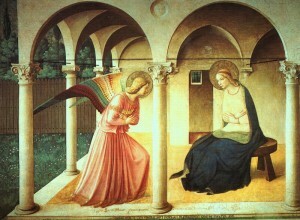 The Sorrowful Mysteries show us that Mary suffered, too. Now, one might say it is hard to relate to Mary in that her suffering is so much more profound: none of us will have to go through what she went through. But that only emphasizes: in whatever suffering we face – just like in whatever joy we encounter – we are walking the ordinary path that Mary walked. Finally, in the Glorious Mysteries, we see that Mary looked beyond the borders of this life, to eternity, and the resurrection. But there, too, Mary’s holiness is ordinary: just like us, the real excitement is something to look forward to beyond this world. Until glory came, she lived in hope – and hope which already possesses is not hope at all. Mary makes sanctity easier to relate to, because she reminds us that it all comes from Jesus, but that it is lived out in the utterly ordinary circumstances of life in this world. What then is the holiness we see in Mary? First, it is love of Jesus – and so the Hail Mary immediately follows “Holy Mary” with “Mother.” Mary is different from us in that she loves him so much more than we do. Second, it is prayer – for us sinners – which is what we ask of “Holy Mary, Mother of God.” Mary possesses nothing, but she knows how to ask for it from God. That’s another key difference between us and Mary. Finally she prays even for schleps like us: her love of Jesus makes her love all of us. One more key difference between Mary and us. How do you relate to “Holy Mary”? Click here for the entire Hail Mary series.